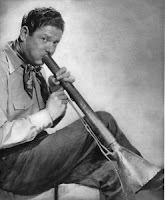 The bazooka was a marvel of science and engineering—the world's first shoulder fired antitank rocket. Using a shaped charge rocket, it was a powerful weapon that enabled Marines and Soldiers to defeat enemy armor and field fortifications. 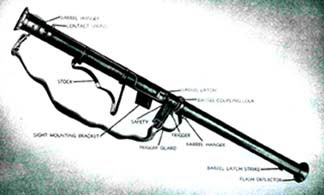 Of vital importance was the bazooka's simplicity of operation and maintenance in the most rugged combat conditions. During World War II, almost 500,000 bazookas were produced to meet the demands of American and Allied forces. Although the 2.36 inch bazooka was a capable tank killer against Japanese armor, the same was not true in Europe. German tanks proved much harder to kill with bazookas. 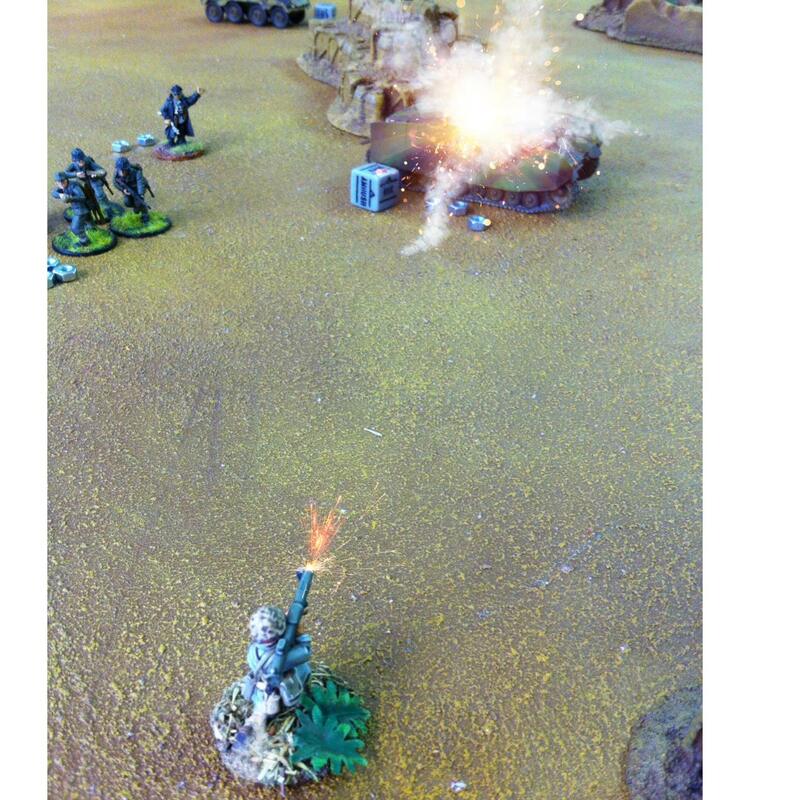 However, in a game of Bolt Action Anything can happen. In order to be effective you should probably best move your bazooka within 9" of the target. It's range and the Shaped Charge penalty to hit will make your bazooka miss on longer ranges. Here you can see my Bazooka take out a German Panzer IV with Shurzen,...Bolt Action will happen! The Bazooka was invented by Robert Goddard, the father of American rocketry and genius inventor. Dr. Goddard developed the basic idea for the infantry rocket launcher during the First World War. With the armistice in 1918, work on this weapon project was shelved, but not before Goddard demonstrated it at Aberdeen Proving Grounds two days before the end of the war. In the interwar years, tank-killing capability for the infantryman came from large caliber antitank rifles. As tanks became more heavily armored, these rifles were less and less effective. With the coming of war in 1939, the US Army Ordnance Department began a top secret development program to give the infantryman a self-contained tank-killing weapon. The bazooka took advantage of the revolutionary principle, the shaped charge warhead focused the explosive energy to shoot a plasma jet through the armor plate of an enemy tank. In June 1942, the US Army officially adopted the Launcher, Rocket, Antitank, M1. General Electric built the first 5,000 weapons in a crash program to equip Army troops for the North African campaign. When Soldiers first got their first look at the rocket launcher, they dubbed it "the bazooka" after a musical instrument developed by entertainer Bob Burns. 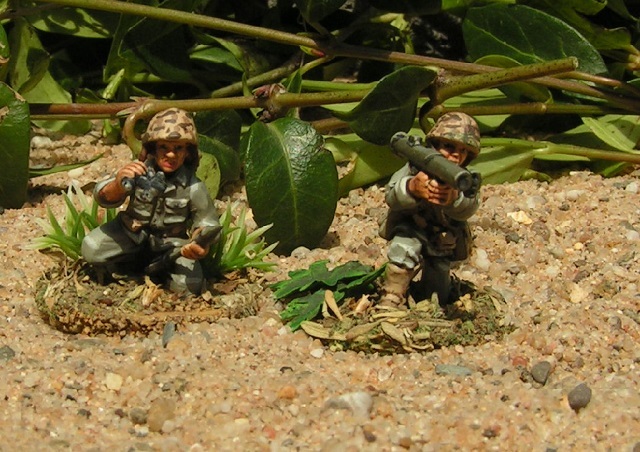 In the South Pacific, Marines encountered many problems with the new bazookas. The battery-operated firing circuit was delicate and the rocket motors often failed because of high temperatures and humidity. But the weapon showed promise as a bunker buster for the infantry Marine. Lessons learned both in the Pacific and in North Africa were used to develop and field an improved version—the M1A1 bazooka. New rockets were also fielded. These had improved motors that were less prone to failure due to environmental factors. 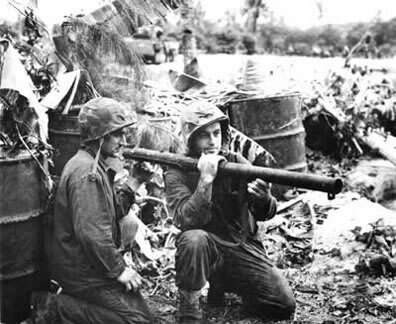 The first widespread use of the bazooka in combat was during the Marianas campaigns in the summer of 1944. They proved extremely effective against Japanese field fortifications and tanks. For example, early in the morning of 17 June 1944, the enemy launched a tank attack with infantry support against the 2nd Marine Division on Saipan. About thirty tanks crashed into the Sixth Marine Regiment's defensive positions. Bazooka teams hunted Japanese tanks in this intense, close quarter fight. Pfc Lauren Kahn and his loader, Pfc Lewis Nalder, were infantry Marines in K 3/6. During the battle, Kahn knocked out two tanks at point blank range with his bazooka. When his rockets were expended, Kahn knocked out a moving tank by climbing onto it and throwing two hand grenades into the turret hatch. For his heroism, Pfc Kahn later received the Navy Cross. Pfc Nalder was decorated with the Silver Star for gallantry in action. In October 1943, the Army Ordnance Department adopted a new model of the bazooka—the M9/M9A1. This weapon incorporated many improvements over earlier models. A trigger operated magneto replaced the battery ignition system and a safety switch made the new model much safer. The tube could be broken down for easier carrying, an important consideration for the infantry Marine. New, more reliable rockets were also introduced. In a global war with competing demands and priorities, it was many months before the M9 bazookas reached the Fleet Marine Force. These weapons were used in combat in the final campaigns of the Pacific war on Iwo Jima and Okinawa. Once again, bazookas were frequently employed to knock out reinforced defensive positions. The bazooka's main ammunition was a high explosive antitank round. The M6A3 HEAT rocket was standardized as the primary round in 1944. An earlier version—the M6A2 HEAT rocket—remained in service throughout the war. Late in the war, the M10 white phosphorous smoke rocket was fielded, but this round did not see widespread combat use.